Try it! It will boil a cup of water in the pan in less than 1 minute. Our NEW Induction Cooker has inductor coils under the ceramic surface, when a Health Craft pan is set on it an electric current passes through the coil creating a pulsing magnetic field. The metals of the pan have a natural resistance to the movement of electrons causing the pan to heat up. It’s the pan, not the Induction Cooker that heats up and cooks the food. Nothing outside the pan is affected by the magnetic field. As soon as the pan is removed, the Induction Cooker shuts off, and heat generation ceases immediately. FASTER because energy is directly transferred within the pan’s T430 Surgical Stainless Steel metal, heating is faster than gas! SAFERbecause there is no open flame, red-hot coil or other radiant heat source to ignite fumes or flammable materials, the Health Craft Cookware helps to prevent burns and kitchen fires. CLEANER because with no grates or carbon build-up to worry about, clean up is a breeze; just use a damp cloth and wipe over the smooth, easy-to-clean ceramic glass surface. COOLER because gas ranges produce unused heat that goes into your kitchen, increasing your cooling costs, with Health Craft Induction Cookware, almost no wasted heat is produced since all the heat is being generated within the pan itself. CHEAPER because 80% of every dollar you spend on energy goes right into the pan! Gas delivers 43% of the energy you pay for to the pan and electric about 44 to 53%. Plus, when you remove the pan from the induction surface, the unit immediately goes into standby mode, using virtually no energy whatsoever. EVEN HEATING because the T430 magnetic stainless steel on the outside of the Health Craft cookware heats at the same level uniformly, there can be no hot spots. The computerized monitoring feature allows maximum heating of the pan. 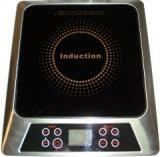 PORTABLEthe Health Craft Induction Cooking Unit can be used safely and efficiently in a boat or recreational vehicle. function during that time, not move the pot/pan on top, the range will shut off automatically. incompatible pan, the unit will automatically shut off. are obtained with pans of a diameter comprised between 16 cm and 26 cm.